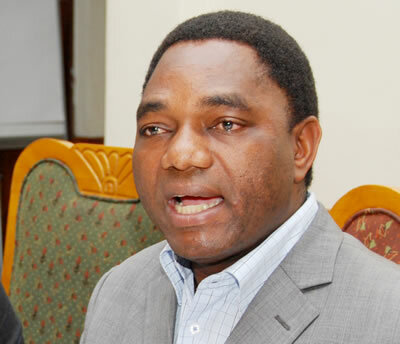 UPND Leader Hakainde Hichilema has described PF leader Michael Sata as a liar and a dishonest person. Mr Hichilema said that it was unfortunate that Mr. Sata who is seeking public and political office can go on Radio to tell Zambians lies about him. He said that it was a blatant lie for Mr. Sata to mislead the public that the two leaders have been meeting after the collapse of the political pact. Mr. Hichilema was speaking this morning when he contributed to a live-phone in programme dubbed ‘Lusaka Star’ on UNZA radio. He said that dishonesty by Mr. Sata was the order of the day even when the two parties were in the pact. And Mr Hichilema said that his party wanted to agree on policies with PF Leader Michael Sata before forming government because they suspected Mr. Sata could have introduced gay and lesbian rights. He said that the UPND did not want Mr. Sata to pull a surprise by introducing gay and lesbian rights once in authority. Mr Sata recently told journalists from Denmark that Zambia has laws that recognise Gay and Lesbian rights which only need implementation. The church and civil society organisations have since roundly condemned Mr Sata for advocating gay rights. On “Mr. Hichilema was speaking this morning when he contributed to a live-phone in programme dubbed ‘Lusaka Star’ on UNZA radio. He said that dishonesty by Mr. Sata was the order of the day even when the two parties were in the pact… Mr Hichilema said that his party wanted to agree on policies with PF Leader Michael Sata before forming government because they suspected Mr. Sata could have introduced gay and lesbian rights” well done president HH for neutralising PF’s Given Lubinda’s vomit in the POST Fudge (PF) magazine. It is really good to see that you have now become a gentleman in defending what is true and frustrating the PF liars and hooligans. Have a blessed day all and vote for UPND to form GRZ Administration with HH as President of Zambia. PATRIOTIC Front (PF) president Michael Sata has said age is fast catching up with his political future and urged the youth of Zambia to prepare for a take-over. Mr Sata said PF vice-president Guy Scott and he had become too old and said the country should be left in the hands of the younger generation because it was clear that he had become too old to continue in politics. Addressing his supporters in Mandevu Constituency in Lusaka yesterday, Mr Sata said younger people should turn up in numbers to vote in this year’s presidential and general elections. He revealed that he had to go to Manedvu to assess the extent of damage caused by campaigns that had been staged by Lusaka Province MMD chairperson, William Banda. HH stop this madness of blaming SATA we need the PACT.you think you are wise enough you will never be a president bcoz you are all so a big liar. If the church voting block is big in Zambia , then am afraid to say that one Serpentine Sata is in real trouble. He better hire tobacco executives who know how sell sin and to grind huge profits even when the masses hate justifiably hate him. I see HH is also taking advantage of the gay perception box in which MMD has created and put Sata in. Basically HH is saying hey am not Pro gay and the reason I broke out of the PACT is because Sata is Pro gay. Dont send him to the grave not until after the elections. He is tired and looking for an Exit Strategy. Maybe, Peter Munchangwa, he is the more reasonable one but is with the PF Rebel Team. I know the PF Kaponya’s will try by all means to twist this story that he did not say it. Its recorded and a CD can be created to prove it. MMD has got it bagged and RB to form the next government. HH we told you. He is not just a liar but pathological liar without personal conscious. Ba HH if you suspected sata of supporting gay right before the pact broke up, why didnt you come out and tell the people of Zambia about before you the pact? now you are been used by people who are misleading zambians over sata,s satements on gay rights. Just vote for a female president. Nawakwi for president. You think KK, Chiluba, Mwanawasa, and now RB could all be saying he is unfit scumbag for no apparent reason? We know Sata was telling lies that him & HH had met to revive The Pact.. The man needs to learn to listen more and talk less. He as attempted to group small parties to revive The Pact. Sadly no one wants to listen to his voice. This is just becoming very embarrassing, even the Post are finding it hard to catch with bluffs coming from Sata every single day. Liar is an understatement. Ba HH stop wasting time on petty matters, concentrated on what you good at, articulating issues, let the incompetent over-aged shikulus expose their own ignorance. 3 Samungunde Mbunda Kalenga greetings. On your “PATRIOTIC Front (PF) president Michael Sata has said age is fast catching up with his political future and urged the youth of Zambia to prepare for a take-over… [PF’s serpent MC] Sata said PF vice-president Guy Scott and he had become too old and said the country should be left in the hands of the younger generation because it was clear that he had become too old to continue in politics” by today’s Times of Zambia Newspaper, I am glad that the PF leader Sata has acknowledged that he has become too old. Ba HH concentrate on MMD they are the ones in power, or are you fearing that Cobra will form the next government so you want to discredt him? As we talk to fund raise for his 2006 campaign he concessioned the entire Luapula land to South African apartheid Boers and defeated Taiwanese ruling party officials at US $ 30,000. This where the US $ 27, 000 still confiscated at Oliver Tambo Airport came from from. To get the balance channeled through Malawi, he landed a deportation there under Dr. Muthalika where the scumbag is a PNG. Now the want their money dead or alive. And you know these international hit-men what they can do if you scam them. Sata is very desperate for fear of his skin from international mafias he owes millions of dollars. Unfortunate for him, MMD wins and Wins big this year. This is game on…. Ba Kaponya from now own, we will reduce you to rabbles. No amount of middling will be let free. Because what you see is what you get. There is no were to run and hide…………. HH, you’re not being sincere my brother. You mean you didn’t know Sata was a goon all this time? We warned you but you didn’t listen, now look at you! This stance has helped UPND gain mileage while PF is limping in limbo after PF thought it was doing a good job of belittling the mighty UPND Team in the defunct PACT. HH and Sata have let us down because of their selfish motives of wanting to rule the country. I see RB in office come what may. Instead of working together so as to strengthen the opposition, they are now fighting each other. They have forgotten about their common enemy the MMD! RB is definitely forming the next government! HH – I had a bit of respect for you but you have just dissapponted me and the rest of Zambians. How can you possibly direct your efforts towards Sata when you should indeed look to confront MMD. The rumours that you have joined MMD are now yielding truth. You are the most shallow political leader I have come accross. Prof Chirwa had given you advice but you have ignored him. Col. Panji Kaunda is giving you advice but you are still not taking note. You have let down great late Mazoka. But why did Mr. Andafaivi tell us about his worries that his biggest bully wud introduce homo rights once in power after Pact died? Why are we knowing about it after burial of the pact that mu guys and his Southern Entourage pulled out becaucse he was worried such crap wud surface wen he be Veep? #20 – I feel sorry for you. Talking about those phoney figures just makes me wonder how you are even able to access the internet and blog. Your intellect is very questionable. But again if you are being paid for posting garbage then who Iam I to question you. Please dont compare the Great Late Andy and Little HH. Its like comparing the brain of a Horse to that of a goat, if size were the matter…..
i think Zambians are the biggest hypocrites, we seem to think one sin is bigger than the other. We go on to get other peoples wives, sleep with other peoples husbands, steal from the poor, buy a thousand pairs of shoes using taxpayers money yet we want to make an issue about what people do in the bedroom.Homosexuality is not done in public yet so much noise is being made. Weather we like it or not there will be homos. Those who are born that way and those that have adapted that life style. I dont see how homos affect your daily life in any way. MMD are not just watching. They were in Southern province trying to get as much chunk out of that block of voters as they can. Am sure they are doing that in all the provinces. They are not taking things for granted, MMD. The “PACT” was the only hope for a revived democracy for Zambia. It seems it’s a pipedream now for the many peace loving Zambians to exercise their democratic rights having weak political parties. The MMD have all the amo now to rig even with fewer votes. What a shame to see Sata and HH now attacking each other. Grow up HH, and start to prepare for elections in 2016. Zambians, Zambians! Right now we have completely forgotten the major issues that are affecting our nation and everybody is now focused on the gays. Thieves like Chiluba are walking free, RB wants gratuity, killing of innocents youths in Mongu, the sale of ZAMTEL, attcks on opposition meetings, the fall of the PACT plus many other issues and here we are talking about gay rights. There is no such thing as gay and right, so lets not waste and find ways of solving real issues! HH has lost the direction. Its not time to talk about Sata now. You are just making him popular by doing so. Concerntrate on reorganizing your party in readiness for 2011 generation election. Already you have lost more than 1000 members in the copperbelt. Panji has also got followers from UPND will go with him. I also don’t think Clive Chirwa is with you even though physically in UPND. Furthermore, if Magande decides to stand, more votes from UPND will go to him, more especially those from Southern Province. Sata should not be an issue now, unless he doesn’t have anything to talk about. Wakeup please! Amayama talk for yourself no Zambias. Which Zambians has HH diappointed for saying that Sata is a filth liar? PLEASE USE BRAINS TO THINK NOT TRIBE. HH, this is being opportunistic, you have sank so low to join the MMD propaganda. If you want to support MMD campaign strategy of character assassination, go on and join them, instead of prostituting. The Economy bla bla bla was nothing. What kind of Politicians do we have? This is nonsense at its best. By the Way, when are you starting you Provincial Conferences, and starting your campaigns against MMD Govt? Now there are a few *****s who are saying HH is misdirecting his wrath. Kindly be advised to tell your homosexual supporting presidential candidate of the patriotic f.o.o.ls to leave HH alone. The Post left HH alone and he does not talk about them. HH is an independent full grown normal human being. He is not obliged to take advice from a professor living in England or Panji. He can choose who from the 13.5 million Zambians advises him. Whether he joins MMD or remains with his UPND is his democratic right. Only scambags will mourn about that. Just register and go and vote. Mr sata is in a real fix over this gay thing. he shed hire a p.a assistant. we all heard what he said.man! way were u thinking saying all that crap!! He doesn’t even know how to mask lies, he’s trying to jump on the homosexual band wagon in a wrong way monga niofunta. Homosexuals are in all parties e.g Capitalist in MMD etc so this is just childish talk from HH. He’s playing ‘tufilile munsenga’ forgetting that RB isn’t UPND neither is he from Choma. # 39, What is HHs stand on Homosexuality? It appears someone’s just declared open season on the kaponyas, everyone’s free to wade in; no hunting license required. The living will never disappoint the dead for the dead know not anything. All political parties should isolate the PF. PF has slept with every political party like a w h o r e monger now it is infected with acquired inconsistent declarations syndrome. Ku bwebweta cabe everyday. Akashishi nakengila mumutwe. the cobra is a big liar and joker. ifwe ni HHHHHHHHHHHHHHHHHHH chabe.. I think everyone is entiltled to his or her own opinion, and no one can take away that fact from us. Those who support HH will do so at all costs, those who support Sata will do so at all costs, and those who support RB will do so at all costs. No one can blame the other as to why he supports his preffered candidate. Thats the way democracy works. Everyone is free to politically do as he wishes, where he wants to align himself politically. To see Zambians go at each other like this on LT is uncalled for. Lets be objective all the time and learn to co-exist in a divergent political climate, brought about by multipatysm since 1991. Read today’s Post. It is also online in case you did not get hold of a print copy. Zambian political definition of tribalism>> Tribalism is refusing to support a candidate from a certain province. If you are astute and sensible, you accept politicians worth their salt not to be one issue based people. I would therefore expect HH to have been involved in policy discussions across a spectrum of topics and he is pointing out one such disagreement across issues not agreed upon among a few others he has pointed out, just as the other side have the freedom to do. As a party, you need to get as many floating voters from the other parties as is possible, so both MMD and PF are legitimate for attack as long as the attack is based on facts but open to embellishment to suit your needs. Outright lies are not helpful and I do not for once feel HH is a liar. KK, FTJ,Our late LPM (RIP),Nawakwi, Banda and now HH let alone his former party members have all given a hint to the man’s (SATA) character. Kaunda family should just have continued with Unip. All they needed was to modernize their party and not follow Chacha style of politics.Any way it is old that you belong to one party and you openly support another person from the other party to be the president. Naturally you should resign the party and join the other one because you have no faith in your own president. Let those who support HH remain in UPND. If Panji supports PF’s SATA he is at liberty to join PF, but don’t sit in one camp and support someone in another camp. I am sure # 20 has a point. Mr Sata lied about his passport in London, he claimed it was stolen but the CCTV images showed him checking out using the same supposedly stolen document. Presidential material? There are a lot of us that woud want HH to be President but thing is, a vote on HH this year is a gift on silver plata to Bwezani. And u know if Bwezani wins, all land in Zambia will be in foreign ownership and by the time he leaves office in 2016, Zambia will be owned by foreigners. Already Zambian copper is hell building economies of other countries and pushing some Indians into the highest ranks of Billionaires’ club in Forbes Charts …. Truly sata is a force 2b reckoned with.People lyk vj have deep experience 4 over 20years of grndng out wins 4 the mmd,only sata can outmuscle them,hence the smear campaign.Hh is now hell burnt on discreditng mr sata but thats not new in zambia! !Hh wants 2b a spoiler.Sata has my vote,b4 nd after the pact.A Man 4 the poor not the so calld intellctuals,84 per cent poverty levels are not joke!! #2 Pie, you are probably the biggest liar instead. Mr Sata has been embroiled in homosexual comments before, except that the last time it was not so big because there was no strong evidence and he lied his way out of it. This time he went one step too far and his luck did not hold. His words and voice are on tape and CD in the public domain. ZNBC TV news at 19.00hrs repeated the tape. All Zambians now know what Mr Sata said on homos, (Zambians rich and poor, educated and illiterate, rural and urban dwellers, ruling and opposition, marketeers, kaponyas, in bars and taverns, in schools). His attempts to deny or twist the story have only served to expose him and the Post for the liars that they are. The Post has never suffered such embarrassing damage to its reputation before. How funny these inexperienced poloticians can be. WE VE 100% votes frm all gays across the country, & yes they are many,…..
#3, it’s not his age that Mr Sata is talking about. He is telling us that his lies have finally caught up with him and he sees no survival this time. In short, after this homo gaffe his political career is in ruins. The good thing about ba some of us is that they are heavily taxed while bakaponya do not pay any tax except VAT and fuel duty notuma TV licence. This means that the 400 000 in formal employment are the ones subsidising the 84% that live on less than a dolar a day. Normaly, one would expect a pro Kaponya policy to ensure that mines are properly taxed, and that levels of formal employment are increased. Alas, they keep insulting PF, we wish you luck ba someOfUs. We all know HH is the right candidate, yet there is timing in everything. Add patience to it, he would have been a president. Chirwa, strategised for him, but am sure he never saw sense in what the prof said; hence the status quo. Too bad ba someOfUs! Kuyabebele!! In fact the impact of attacking Sata will actually be the opposite: he will get a lot of sympathy votes; and those that will go to his strong holds for votes will find it hard to get them. Personally, I know there are people who are very hurt by this approach. The respect people had for each other, and make no mistake, the fckn 1 Zambia 1 fcken nation is being diluted day by day. Does anyone wonder why MMD and their little Southern sisters have teamed up to scandalize Mr Sata? Please wonder no more, its because the heat is getting to them such that they are spending sleepless nights even free masons like HH that dont sleep at night are also panicking. As we draw nearer to the D-Day please explain to your kids why they will be seeing more Chanda Chimba on ZNBC and less and lesser of their favorite Thunderbirds and Roger Ramget whatever. This masonary HH is a traitor that should be taught a lesson or two about loyalty and humility, he thought he could just jump straight from ujeni onto Presidency, we’re sorry mujembele you’ll never see the corridors of power outside choma and monze. Come 2016 we shall float Nawakwi as your waiting prolongs. VIVA SATA VIVA PF. HH look at yourself, no one Is talking about you cos have nothing to offer to the UPND and the Zambian pipo. Attack the MMD coz that’s your number one enemy. Or tell us that now the PF will form the next government so you want to join PF. You will come number 4 if you are not care full. Sata will is winning followed by MMD then Magande or you HH. So try to reconcile with sata if you want to be in gov next year. You are being very childish and immature with your political campaigns. I had so much respect for you. You were a man of issues now what has gone wrong with you. Am sad for you dear. Ba sata is that a pf policy on family planning? Homosexuality ? Awe takana. No matter what you ve lost my vote rb. Im disappointd wit HH as a would b accountant bkoz he has sunk so low 2 MMD propaganda abt homosexuality. Pipo u shud also b thinking thinking what is beta you denounce homosexuality nd support plunder of public resources thrgh aquiting the currupt nd removing abuse of office frm da constitution. Denounce homosexuality nd allow your cadres 2b violent against opposition party cadres at the expense of security of the state because if the opposition also pick up machetes then civil will break up, so pipo as much as we support our parties lets try 2 stand 4 wat is right. Sata Chinangwa sana. How can a normal personal have policies of telling his cadres that after offloading your waste in the toilet turn it into a sexual tool also. In short he is defying God that the way he created man is wrong. No wonder his son Chilufya died from effects of homosexuality acts in his bedroom only to be discovered decomposed 1 week later under Sata’s own house.What a cursed father wasting his time to destroy the Zambian moral, cultural and spiritual fabrique. “…they suspected Mr. Sata could have introduced gay and lesbian rights.” Work with facts HH, not imaginarey fears. If you display such cowardice, afraid of the unknown and refuse to listen to your advisors like pro Chirwa, how can people in their normal senses put you in public office? If you cannot work through ‘Pact’ issues and if all you do is blame everyone else, how can you aspire to work out diverse and complex issues of our Nation? You are simply simpliting votes HH just like Magande, Chipimo, Siulpwa, Milupi, to name a few. The PF is the only party in the whole world which has 15 MPs sponsored by the party but not acting according to instructions from the head of their party! Now imagine if he was Republican President with state instruments at his disposal, I shudder to think where Machungwa and company would have been today. The point is if his own party members do not see much in his leadership, why should Zambians? Mr S wants to be President not because he has a vision for Zambia, but to settle old scores. HH compacted with him, and found tamwaba amano mu mutwe mulya! Cikopo fye! Zambians we must be ashamed of ourselves.The level of our debates on this forum is embarrassingly shallow.Lets discuss real issues at hand and not personalities.If HH misfires we must point it out,so goes with Sata.Avoid this blind support just because a certain candidate is from my province.Zambia will never develop under tribalism.We are all one.No room for violence. May i call upon all intercessors to rise and pray for the nation.Be blessed! You must be mayopic to say the least. Exposing him and attacking are two different things. If attacking someone makes the personal more popular, RB would have won by over 75% considering that a tabloid had been attacking him from the day Mwanawasa died to today. I bet you no edition of Post tabloid has run without RB being attacked. About 99% Editorials of Post tabloid have been on RB while no page starts and ends without RB attack. RB has been excelling because none of these tabloid attacks are exposing him of anything but are attacks. Sata is being exposed left right center based on empirical facts. Empirically his Gay interview has turned into a hot public CD whether gathered covertly or not but people have it listening too. Its funny that you can call HH Masonist just because he is wealthy. I don’t know what you will call some us working hard towards more and overflowing prosperity in our initiatves? Do you know that Sata is actually a Satanist, a devil incante whose name derives from satan hence all his push are satanic? Don’t be jealous of prosperity just work hard and cut your slavery to the utopia of more money in your pocket within 90 days. @ Lundazi Zealot Amen to those true words. HH an evil of Masonic proportions, while Sata slept with ideologies of the gay kind. This evil pact had to fall, I guess we are stuck with our time tasted known evil MMD. * sigh* Miyanda please arise and find vibrant young men and women to fill up your upper middle and lower ranks. #76, thats a very well thought out contribution, salute you. Zambia is poor, footbal association of Zambia is not functioning well also because of this hero worshipping of having people who have failed us before to be in charge of our affairs. Country men and women when are we going to wake up for the good of the nation. Kalusha Bwalya is holding two posts in FAZ (technical director and FAZ president) and getting double allowances, which is against FAZ constitution, but everything is silent because it is done by other people who are immune to scrutiny. We cannot allow a few individuals to manipulate us and take advantage of us while we are watching, we know that their economic survival but it is not fair indeed. Simataa is being wounded out of FAZ because of his objection to injustice, and now wants to rule us after all bad things he has done. THIS THE PROBLEM WITH OPPOSITION POLITICS IN AFRICA. OPPOSITION PARTIES LEADERS DON’T SEEM TO UNDERSTAND THAT THEY CAN’T ALL BE PRESIDENTS EVEN IF THEY COLLABORATE TO UNSEAT AN INCUMBENT. AND BECAUSE OF THIS STUPIDITY, THEY THEN FORM PACTS, JVs OR MARRIAGES WITH PEOPLE THEY DON’T AND DON’T UNDERSTAND. THESE TWO GENTLEMENT ARE BOTH LIARS AND TIME WASTERS TO ZAMBIANS. HOW CAN HH TAKE SO LONG TO KNOW THAT SATA IS A LIAR AND UNPREDICTABLE? IS HE BEING HONEST HIMSELF? LT is slowly becoming a HATE site. Soon people attempting to read postings on this site from work will soon be blocked, especially in companies that have strong anti-discriminatory policies and strong filters on their servers. The level of bigotry is frightening. The tone of the postings provides evidence that a Rwanda style massacre can take place in this country. In future all you need to do is accuse someone of being gay and Patriot, Senior Citizen, MMD Chief Bootlicker, Capitalist and now HH will spring into action and kill the accused without asking any questions. It seems MMD have lost all credibility. All they can do is appeal to peoples’ bigotry. If it is not gay bashing, it is tribalism. Apparently Bembas are the lowest form of life in the eyes of most bloggers here! @ 79 the patriot just like his former boss mazoka, HH is intertwined with masonry. No one is jealous of his money or status quo, but we are in support of a God leaning Zambia even though we have a mirage of less than adequate pool of leaders to choose from. Wonder why PF and UPND supporters have battled from day one? MMD is taking these elections with no hesitation due to vote splitting amongst the two opposition heavy weights; more like a heavy PF and bantum weight UPND hahahaha. @ Lundazi Zealot No# 93 Well said again. President Banda is supposed to send and direct the police today to arrest for prosecution any MMD and PF cadre that caused drama and mayhem yesterday. That shall be a good example like his apology for MMD thuggery yesterday. Though I have spoken on mbuya terms to my Bemba folk, it’s time PF (Bemba) and UPND(Tonga) nonsense was curtailed. It’s tribalism run amok, we are tired of the hypocrisy; but above all hurt and mad at the lie that was the pact. Wasted poor Zambians time with false hope and constant bombardment of character assasinations. Grow up politicians and for once give us your plans for economic moral and social development. So you are all pretending you do not know the POST are responsible for driving the hate agenda. FDD Nawakwi we told you not to join the pact but did you listen no! Miyanda and Nawakwi should revive Heritage and FDD cause Sata and HH stay fighting hahaha. Sata is using the Post and his henchmen to attack HH so what is wrong with HH hitting back using media that will allow him to express his views. If you want fair play then tell Mmembe to allow HH/UPND to express their views instead of just reporting only news that disadvantages HH. #100, you sound like a PF cadre who has come to terms with reality. I dont think Zambians would be bothered even if you never went back anyway……If you insult like that in America, you risk being arrested. What makes you think that all those who support HH are tongas? Are you God to know the tribe of each blogger? This is just a reflection of your own tribal tinted mind! Listen properly, there are a lot of us non tongas who support HH because he is simply the best person to rule Zambia. We will continue supporting him whether you like it or not. @ 99 Lundazi Zealot, I have been optimitic remember with God he cam turn the bad to good. Miyanda and Nawakwi will be loved cause mostly Miyanda never character assassinates, while Nawakwi getting advice from Miyanda would be a Dinamic opposition leader if Miyanda was president. Heritage being in office while FDD was the main opposition, I can dream big right. One because Miyanda would keep his ministers in check while women would know a lady leading the main opposition could end up being presidents. Our mothers and sisters would have something to smile about. @ Lundazi Zealot if PFers were more like you & the leadership inclusive Zambia would rise. But with the likes of Kambwili and GBM my heart goesout to mother Zambia. # Cool te bu PF cadre, do you really know how painful it is to see our country’s leadership engaging in politics of insults. I’m tired I want to hear something good coming out of these otherwise educated and respected people. Kettle calling the pot black. All zed politicians are damn liars. Choose the lesser vice- but who? LT your games have started again, why is my wonderfully long post not showing? @ Lundazi Zealot No# 93 Well said again. President Banda is supposed to send and direct the police today to arrest for prosecution any MMD and PF cadre that caused drama and mayhem yesterday. That shall be a good example like his apology for MMD thuggery yesterday. Though I have spoken on mbuya terms to my Bemba folk, it’s time PF (Bemba) and UPND(Tonga) nonsense was curtailed. It’s tribalism run amok, we are tired of the hypocrisy; but above all hurt and mad at the lie that was the pact. Wasted poor Zambians time with false hope and constant bombardment of character assasinations. Grow up politicians and for once give us your plans for economic moral and social development. As we move on. HH you may be right on this and most likely are, BUT , you need to be called to book for being part of the directionless mob that took people eyes off the ball; which was growing a formidable movement which would have given the ruling party a good run for their money. now all is lost! 2 0r 3 years down the drain. we will need at least another 25 years to recover this lost time. nonsense!!! Zambian politics at the moment are personality based because all the major opposition Parties were part of MMD. The core of both PF and UPND MPs were at one time MMD MPs. UPND was formed after Mazoka was hounded out of MMD by Sata. Sata left MMD because he wasn’t adopted as presidential candidate by MMD. Both Mazoka and Sata left MMD not because of policy or corruption. PF and UPND can’t campaign on the slogan of change. If Zambia needs genuine change it has to be a new set of people that have not been in mainstream politics forming a party on the basis of policy. One advantage would be there would be little personality politics but issue based and a real choice of an alternative. On the issue above, I thought HH was an appeal to the intellect. If the story is true then he has really done a bad job on selling himself to that market. The problem for the UPND is that Zambia already has a neoliberal party. That leaves the UPND only with their base in Southern Province for support. The people want a change of direction – a radical one, toward demand side economics which puts people first, and away from this neoliberal garbage that only enriches the bankers who own these foreign mining companies. :(( @115 hahahahahahah, to those supporting HH grow up ,when did HH learning politics such that people can vote for him ? it was good that him(HH) was working with MR SATA to gain experience in campaign or politics not only talking no sense like that , look the whole world knows that in Zambia theres a man so called who can talk something sense able.and to u pipo of Zambia any1 form part is to vote 4 him , no! learn to give votes to those who are experience in it, thats y panji is supporting him(SATA), ???????? ?he is attacking SATA the big part and not ruling part what a shame on this young man so called HH.to those supporting SATA please continue this man seams to change Zambia with realities, “HH suspected Mr. Sata could have introduced gay and lesbian rights.” Work with facts HH. It is just good that the Zambian people have now known who the true HH is. Is this the man Zambian people were even contemplating of making Vice-president of Zambia? HH is now exhibiting absolute shallowness and clear lack of judgement. Is this how K25 billion from RB can make a once promising young politician lose it all? I just can’t believe this; let me hope that HH has now developed psychiatric issues; this would perhaps make it easier for people to understand what has gone so wrong so fast with this underfive HH. If HH still has a little senses remaining in him, I would strongly urge him to zip it! It is good that the sword that the Post were so much happy with and used it to blungeon President Rupiah Banda has now been turned on their Presidential candidate and they are crying foul. Like someone said HH will hit you hard. Govt media will hit you hard. And the intellectuals on LT will hit you hard. At the polling booth we will also hit you hard. For those who use the sword to kill shall also die of the same sword. Square, isn’t it? @jonathan mwanza 113, hahahaha I like your post. Tonga Steel. 121 true true hahahahahaha. HH is not different from George Kunda. Thank Lord for exposing this Wolf who was hiding in the sheep’s skin. HH and FTJ are a danger to Zambian politics who will do everything to hide their true selves. HH’s businesses have disappeared and the only way out is to support Banda and keep his head afloat, economically. HH has no feelings for the people of Zambia.His entry into politics was for himself and himself alone. The truth is that he knows he will never be a president even in UPND after this year has made him a bitter and uncompromising person. Somehow, HH just became the new campaign manager for the MMD and RB in Southern Province. HH thinks he is screwing up Sata, but the truth is that he just screwed the all entire nation. His greediness, and his lion’s appetite for power is now what Zambians have to deal with. Shame. zambians love poverty. Anyway coming to the topic Sata has lost it. Now on this blog the MMD has joined hands with pf attacking HH the man of the moment. Pf supporter shud come to terms wth reality that Sata wont be a factor in this yr’s election. HH has gained ground and by the time we go to vote the disgruntled pro pact voters ‘ll ‘ve recovered and without doubt most ‘ll find HH more appealing than the two grand failures(Sata&RB). The prophecy ‘ll surely come to pass! Homosexuality is an issue better left undiscussed–if undiscussed is the word–as a Zambian opposition politician has found out for seemingly suggesting that he would allow the practice if he is elected president in this year’s forthcoming presidential, parliamentary and local government elections. Leader of Zambia’s biggest opposition party, the Patriotic Front, better known by its ubiquitous initials, PF, Michael Sata has been linked to meetings with some diplomats from western donor countries accredited to Zambia where he has allegedly pledged that if and when he is elected president, he will recognise the rights of gays and lesbians in the country. Ever controversial and thoughtless, Sata, a veteran political opportunist who rose to prominence as the capital, Lusaka’s governor under first Republican president Dr Kenneth Kaunda’s administration after corning kumulu lesa panshi kaunda in the 1970s and went on to become the present ruling party, MMD’s national secretary and minister without portfolio under second Republic president Frederick Chiluba, has attempted the presidency three times since 2001 to no success now turned into a gays crusader. HH greedness has left him a nonentity in political circles. He has lost direction and is just concentrating on the “Bring Him Down” syndrome realizing he has failed. He is so confused that he does not know which direction to take now. SATA is your fellow opposition and the two parties should have parted amicably such that you share some strategies like poll observations and security for your people from MMD thugs. But what we see is a person so lost that he doesn’t even know which party to attack. Wounded fighting BULL. Mazoka sholud be very upset how HH has spoiled his chances. Sata formed his own party in 2001 follow an abortion of his crusade for unconstitutional third term that followed Chiluba anointing, Levy Mwanawasa, his former Vice President who resigned his position on account of his differences with Sata’s corrupt and tribalism between 1991 and 1994, to contest the elections that year, by-passing him after he allegedly hounded out eligible members who had opposed Chiluba’s unconstitutional shot at an unconstitutional third term of office. For his homosexuality crusade, Sata has been under fire from every moral class in Zambia now picked up by current Vice President and Minister of Justice George Kunda who attacks the practice at every opportunity including in parliament. Kunda’s incessant attacks of the sexual practice recently attracted a volley of Christians denouncing Sata as a crusader of satanism and evil spirits. SATA is a new gay advocate period. The Post has given him this role as they can not effectively champion it seeing that they have no following. So in the meantime they are using SATA knowing too well that SATA’s supporters are blind, dull and unreasonable and can support anything. Even urinating in their mouths they will say yes, yes, yes . Ba Mwata, this issue of gays is a non starter. Only people who are gay would even be talking about it because they are not real men. A real man would not be talking about such private bedroom issues. Only when they want to hide the truth about themselves, they will pretend they are straight. So, how come so much interest in this topic when everyone has put lid on it? Are you one? I am just asking. HH HH HH HH kindly have an upright thinking strartegy,i for one can read between the line wat yo intentions are..Continue supporting the MMD,the party you kod all sorts of name but wat i ken assure you is that the vice presidency you a dreaming of being given by MMD wont come your way unless in your dreams..mark my words..RB cant foresake George Kunda my foot.. This development has prompted American-based Zambian internet politician now a PF cadre, Henry Kyambalesa “the learned Vice President and Minister of Justice needs to take a neutral position on issues which are likely to incite some segments of Zambian society to rise against Sata. He needs to take the lead in ensuring that whatever he says is not based planting hatred against Sata and his gay campaign, or on promoting hatred for a particular politician or group of citizens”. ## 99 please stop attacking our newspaper at least that is the only newspaper that covers us hundred per cent. The Post is our own propaganda machine and am happy that you are feeling the great propagand. We have the best brains behind us the likes of Fred Mmembe and our own PF special correspondents, George Chellah and Patson Chilemba. Viva Guys you are doinga great job for the PF. You chaps should be crying George Chella and Mr mighty Thomas Nsama are going on a campaign trail with the president on the copperebelt. you see what propaganda they will bring back. Viva Fred Viva Post viva PF. What is HH’s position on the PVT? He seems to be quite on this very important matter. UPND followers and cadres, please, enlighten us on your messiah’s position on PVT. Is he for it or he is opposed to it? But what has landed Sata in political soup for which some sections of society such as the church and the media have threatened to de-campaign him for the elections just a few months away, is an interview he allegedly gave to a Danish newspaper in which he stated that Zambian laws in fact recognise homosexuality. He, however, did not specify which parts of the law recognised it. The only laws that talk about homosexuality in Zambia are those that seek to punish it. The church is very vocal on this issue simply because Zambia is a Christian nation, having being declared so by President Chiluba in the first few months of his presidency in 1991 and is now encapsulated in the Republican constitution. For your information, Sata is also campaigning that Paedophiles should NOT be locked up but be given professional help and treatment. What kind of foolishness is this? Now, Am I discriminating the Gay Society? Hell No!!…. Nevertheless, Zambia does not need to invite self-destruction and disown our Culture morals and Christian Values. This name calling kind of politics will not take us anywhere….! HH should not adopt the king cobra’s tactics he will just tarnish his image for nothing. Sata is now president of LEGATRA or Lesbian, Gay and Transgender Association Zambian chapter. Zambia is not a Christian nation. No where in the constitution does it such. The person who declared Zambia as such, was doing so to steal and use it to sleep with born again women. Ask Vera. Christian nations does not declare corruption legal. We have lost it all. Brother against brother, RB be is enjoying it thru his state machinary. This is disgusting, nausinating. I cant believe we have been had again! Reading what most bloggers have said I can see most Zambians are aware that all politicians are liars. For most of us that is a long time well known fact. Most priests would not last in politics. So the question is how do you vote? For the best liar? For the one with less lies? For the one whose lies are closer to the truth? For the one whose lies will not dissapoint us much when we discover the truth? HH now your being being petty.You refused to humble yourself in the pact stop attacking Mr. Sata he is not yet in power .You have proved to be a political under five and misfit.mR. Chirwa advised you to accept VP position in the pact you refused because of your arrogance and now start telling lies you let down politician for nothing.Dont waste our time we are very much anoyed with you .People on the copperbelt are planing to stone ypu when you go there for your compaigns we are now fed up with nonsense we want progresive politics people muust exhibit wisdom and maturity in politics.DONT THINK YOU CAN MAKE A GOOD POLITICIAN /LEADER JUST BECAUSE YOU HAVE GOT MONEY LEADERSHIP IS GOD GIVEN.GOD BLESS ZAMBIA AND MICHEAL SATA FOR 2011.PABWATO!!!!!!!!!!!!!!!!!!!!!!!!!!!!!!!!!!!!!!!!!!!!!!!!!!!!!!! Ba round faced tribal HH mwaitaya.Just say you are MMD.Even if MMD wins we can assure you that come 2016,we will never vote for your round face.Useless boy,Ichipuba,Indoshi,Pushi! Character assassination is part of politics even in the most advanced democracies of the world. HH has every right to hit back at gay advocate Sata. Sata is a danger to democracy and that is why every right thinking Zambian is against him. He is the Mad Dog of Zambian politics. If Zambians made a mistake of making him president we will end up with a constitution that says “only someone who has been a gay for 10 years can be president” so as to allow one well known newspaper owner to be the sole presidential candidate. Truth pains? What did HH say that all of you bloggers don’t know already? Why do you conveniently want to crucify HH for stating facts? Did Sata and HH meet to discuss the pact’s second coming? If they didn’t why did Sata say they did? Was Sata telling lies? Pls don’t hate the messenger, hate the game! we can now prove why this man is called UNDER FIVE, maybe he needs to listen to Dora’s advise. HH is really causing a stir in Zambian politics. I can see the Post have now gone into full throttle to discredit him but they have failed before and they will fail now. HH represents REAL change. If Zambians want change then HH is the answer otherwise we are better off with RB than moving the country backwards with Sata. This is the message the likes of Mpombo should understand! Mpombo, I know you are reading this, that is the answer to the question you asked in the Post. sata is very inconsistent..we dont need such old liars..we have to move forward..HH is the answer!! YOU GAY MAN PLIZ STOP LIES ,WE ALL KNO NOW THAT YOU WNT TO GO TO STATE HOUSE ED SUPPORT THAT GAY ISSUE OF YOURS.FOR YOUR OWN INFORMATION WE AR NOT ALLOWING YOU TO GO THERE ED YOU WILL NEVER GO THERE,PREPARE NOW TO GIVE YOUNG ONES,WHAT A LIER AS OLD AS YOU ARE. Just Shatup iwe Ka HH….why making so much much noise , you are Big loser……..
Mpombo, you are the most pathetic Judas Iscariot Zambia has ever known. Levy must be turning in his grave for your betrayal. You are a shameless person with the memory spun as short as the life of a friut fly. Is this not the very Sata you are trying to shove in the trought of Zambians who forced Mwanawasa to resign because of his tribalism and corruption in 1994? Is this not the very Sata how gave Mwanawasa sleepless nights when he ganged up with Chiluba to claim among other things that LPM was persecuting bembas? How can you sink soo low as to betray your friend like that? LIVE HH ALONE IN SHORT HE IS SAYING THAT YOU SHUD TELL THE TRUTH YOU OLD MAN. THE PACT YOU ARE TELLING THE PUBLIC THAT IS STILL INTERCT ED NOW YOU ARE SAYING WE MEET WITH HH LIAR ,YOU AR NOW BECOMING MAD. This homo thing is Gvt propaganda to make people hate sata. If you listen carefully on that CD the way sata started clearly shows he is not supporting gay rights. He stated that as he comments on the subject people should not think that he would bring back gay rights. But ZNBC is just playing a small portion of the cd. If they claim they have a 45 minute tape let them publish it in the print media and not just playing a small part so that they mislead the nation. Do you guys see how dull HH looks? This guy wants to be President? Where? HH you have lost your ever closest to becoming vice president. My dear mark these words,you will never ever rule as president of the republic of Zambia. Just go back and join hands with PF at least you would be vice president. Opposite poles repeal each other(SATA / HH).It is over. And Sata wants to be President! Where? Ba HH you have no vision. Just resign as party president and give way to others. From the word go you were timely advised not to form the pact but you went on. You knew who Sata is but your greediness for power overshadowed all your principles. Your godammned Pact with Sata has left some of us with no other alternative but to vote for other Parties. Am very ANGRY WITH YOU AND SATA. JUST GO HH, JUST GO HH, JUST GO HH AND TAKE WITH YOU SATA. LASTLY PLEASE GO. HH work up man, Sata used what is known as public relation but there you are again crying out the loudest. Wina Azalila. HH, Why waste your time with the past? I was hoping you’d by now be busy selling yourself as next President, what you’re going to do for the country and extending your hand to other parties to work together with you. I am surely not hearing HH correctly these days. What has gone wrong? Maybe HH should take Siliya’s advice and stand as an MP, its clear that he badly needs some experience in Zambian politics! Little sunny chintombwa aka hh always wanting to ride on other people’s backs. You thought you would have it easy after bulldozzing your way into upnd after Andy’s death. You have lamentably failed. You will never be president of this country sunny chintobwa. The hounding out of Sichinga, Mtonga, Saki, Chisanga from upnd by your tribesmen because upnd should be lead by a tonga is stuck on you like a tick on your ndenkete infested cattle. Ba pf HH is hiting you hard. Viva HH. HH to me you are just a foolish fool!! !you will never go anyway,if southern province was a country maybe you can be there president but not Zambia….take my words very clear.we have eyes to see what is happening and we have hears to hear what is happening,for your own information this time around you are not getting many votes even in southern province.my advice to you is just to do what siliya told you,because you are not going anywhere.just come out and tell the Nation that you are now a MMD carder together with your kantemba party!!! !VIVA VIVA VIVA BA SATA!!!! !you are the only hope for ZAMBIA!!!! HH if you are nit in government this year,you will never be,so is Mr Sata,you will be called POLITICAL FAILURES of your generations,because this is the only opportunity and Chance MMD can be removed from power…but you are putting too much of personal intrests first.am sure before the marriage of PFand UPND,Mr Sata and HH,knew themselves better…Zambians are able to see all these. HH and your UPND minions get a life. Its now clear that you are the one who broke the pact today you say this and again tomorrow the other thing marubbish. Get it straight in this year’s election you will just be a spoiler otherwise it is not too late for to find yourself a Constituency in Southern Pronvince and become an MP. Otherwise you have just kissed prospects of getting into State House at one point goodbye even in 2016 you will nto ot even be a factor. Pact was the only way you could have used cleanse your ka small tribal party from that tribal tag. This HH boy seems to be under the influence of narcotic substances. He’s not making sense at all. LT you are so biased, why would my comment be a problem when other bloggers like JOHN PHIRI , msana wanzili and others who are so tribalist and don’t know how to debate but only insults? be real, let me also enjoy my freedom of speech LT. Unless you blog all those who only insult on this site, then all shall be well. will soon start the fight with these weakling Bembas. It’s sad that the pact is no more. But it’s even sadder that this HH chap and his followers have adopted a ‘TUFILILE MUSENGA’ attitude. HH no longer condemns RB and the ruling MMD for their misdeeds but focuses his energy on condemning comrade Sata. That shows how frustrated and immature he is. As he has already stated, he cannot win by going solo, but that should not mean frustrating those with the stamina and zeal to king out the MMD. He should realise that by taking such a stance he is creating more enemies and losing more voters for himself among the Zambian masses who want MMD out. Grow up bwana hh and focus on your energies on decampaining the common enemy-MMD! We have groups in Europe that are campaigning that Paedophiles should NOT be locked up but be given professional help and treatment. What kind of foolishness is this? Sata has finally lost it. Surely how can he make such a statement. We need to be careful with whom we put in plot 1. Some of these laws other sectors of society wants to put in effect when voted into power can put our peaceful nation into chaos. These are very serious issues that cannot be taken lightly. So Zambians, watch out! HH you as well have started wasting our time by constantly singing about the Devil you slept with. HH,word of advice,by all means pls stop talkin about sata.just the slight mention of his name is dramatised by grz vuvuzelas.just concentrate on marketing yo self and the UPND.CONVINCE UU WHY WE SHOULD VOTE 4 U AND NOT TELLING US WHY WE SHOULD NOT VOTE 4 SATA,infact u should be telling us why we should not vote RB,period. Speaking from a purely political perspective, the HH strategy is extremely poor. If his goal is to get to State House, then his target is very clear. Unfortunately, he seems to be caught up in shooting blanks from all angles and never hitting the mark!!!. Wow…… Intelligence may be a desirable factor for selecting a president but if these are the measures of intelligence, then UPND should go back to the drawing board. Even supporting that which’s evil is being evil too. This is what mmd minions are doing .Unfortunetely ka HH and his minions have copied it.No wonder the so called Tonga Association have ditched upnd to join the useless mmd. Though they are also a useless group. HH ndiwe mwana wa kagalu! Its like HH has won people’s hearts in trying to discredit Sata. I knew that one day Sata would dig his own grave. He just talks too much. Kukambakamba chimudala mwaona manje vamuleta ku Yakumbuyo. He had it coming. It end here. NO VOTE for you SORRY aSata!!!!!!!!!!!!!!!! I knew Sata would lose it. How can one ever talk of promoting gays in Zambia? Mwaitaya baba. Sorry HH you have missed on this one.You have no reason to fight Sata.Sata is on the ground working and he shall reap in due course.Sata we are behind youThis young man has no character at all jr is a total failure. the PF maggots are so drunk..they will not win..! Hakaivotela Heka (HH), you truely are under 5. You’ve been caught pants down, and to show you that you’re a failure, the PF will get all your MP’s from Southern Province into our party while you remain alone. I honestly expect a SMALL PARTY PRESIDENT to at least consult and get his facts before isuing statements, but then i realise he is Under 5. Most times it’s hard to follow what is pertinent and paramount to the Zambian people. Especially when issues such as Gay rights, women’s rights religion and many such facets of life take centred-stage in the election year. We Zambians need to wake up. We have been looking for a pragmatic leader to steer Zambia to Higher heights since Kaunda and a little bit of Mwanawasa. Chiluba was lost time for Zambia and so is Bwenzani, with some Chiluba links/connotations. I will just support my fellow woman Nawakwi mwee, too much male disappointment, our hearts are broken with fake promises! Tiyende pamozi ndimutima umo……. HH tiyee tulipamozi tiyende pamozi ndimutiima umo. PF the boat sunk ni Titanic a tribal part. MMD ncikoloko califwa stopped moving pa 12hrs during lunch time after kukuta kudya. HH you are the man hit Sata so hard damping him at the 11th hour. Sorry no state house for the old man. Zambia Forward bane. Ka Nawakwi nika husband snatcher don’t be any closer to her, wives be careful hold your husbands tightlyNawakwi is coming. HH show them baby, atleast under 5 can still stress and confuse the 75 oldies. So who is smarter under 5 or the 75 blind oldies? HH twalishiba twalishiba ati balimibosha kulu ba MMD. How can u rule the country like that? U’re not fit to be a president mudala, lost sheep!!! Nkokuti twabeshya mushyoko okwesu tuli babi…balo na babeshya bulumbu chilikabotu? Baile kutapata mbuli nswi. Mwakabona ako kategwa Donchi Nzi oko!! The latest news is that the Law Association of Zambia has stated that the use of PVT as an election monitoring methodology is neither illegal nor criminal. My colleagues all think sata is the joker in this years elections. Now lets be sincere, who takes this man SERIOUSLY?? CONGRATES TO BATATA BASATA.YOU HAVE MADE IT FINALLY!!!!!!!!!!!! :d:d:)>-NOW WE HAVE TO SEE A LOT OF CHANGE IN OUR COUNTRY.GOD BLESS YOU AND GRANT YOU WISDOM. My brother recommended I may like this website. He used to be entirely right. This publish truly made my day. You can not believe just how much time I had spent for this info! Thank you!